After opening in the third Test match at MCG, Indian batsman Hanuma Vihari returned to his preferred middle-order slot in the fourth and final Test at SCG and he hardly showed any signs of change in roles. The right-hander was his usual self irrespective of where he batted throughout the series as he looked at ease against both and spin. On day 1 of the fourth Test, he took on the Australian bowlers as he hit some glorious strokes and remained unbeaten on 39 off 58 balls. With the wicket offering nothing for the bowlers and the Australian bowlers tiring out, the onus was on Vihari to seize the advantage and cement his place in the side. He was looking to do that as he was in complete control as he faced 36 balls in the first hour of play without being troubled. He tried playing the sweep and the ball scooped up in the air and Marnus Labuschagne completed a simple catch at forward short leg. Vihari couldn't believe that the umpire's finger went up immediately and the Andhra batsman revied the on-field straightaway. The bowler, Nathan Lyon, wasn't convinced as he straightaway suggested to his teammates that the ball took his biceps, not the bat. The replays initially suggested that the ball ricocheted off his biceps and even the hot spot had nothing in it. 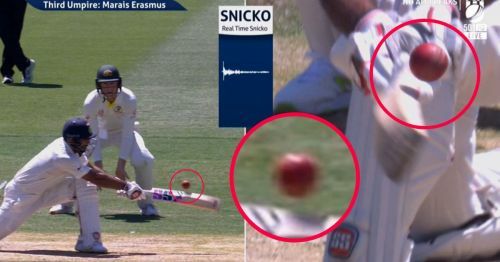 When the third umpire Marais Erasmus asked for snicko, there was a small spike when the ball went past the bat even though there was daylight between the bat and ball and the ball's shadow was clearly visible. The third umpire didn't take his time and ruled him out immediately. The replays suggested that there was nothing when the ball went past Vihari's bat and Erasmus could have ended up making a wrong decision. With a lot of time available, Erasmus could have taken his time and common sense into account rather than trusting the technology blindly before making the final call. It’s jus the start of 2019, and we already have a technological error. What do you think of this decision? Was Vihari out or not out? Share your thoughts in the comments section. Australia vs India 2018: Who should bat at No. 6 for India - Rohit Sharma or Hanuma Vihari?